CSC's Dave Zabriskie, who won Sunday's Dauphiné Libéré, absolutely tackled the race's individual time trial today. 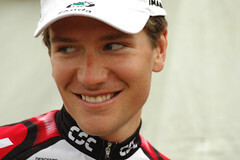 Zabriskie, who Discovery Channel DS Johan Bruyneel reportedly has called “the most aerodynamic rider in the peloton,” put nearly a minute into Floyd Landis in 2nd place, and more than 90 seconds on Levi Leipheimer in 3rd. That is a major woodshedding of the entire pack. The United States took 1st, 2nd, 3rd, and 4th on the day, with Discovery Channel's George Hincapie 4th. Berth Grabsch of Phonak rounds out the Top 5. Zabriskie couldn't claw his way back into the yellow jersey, but he does rise to 2nd on the GC, behind only Française des Jeux's Philippe Gilbert. Landis, Leipheimer, and Hincapie are 3-5, for now, with the 186-kilometer stage finishing atop Mont Ventoux coming up tomorrow. Landis, on the other hand, has performed brilliantly in the mountains this year, winning Paris-Nice, the Tour of California, and the Tour de Georgia thanks to his climbing skills. Finishing just 53 seconds behind Zabriskie, the Phonak leader demonstrated that he was prepared to challenge for the yellow jersey in next month's Tour de France, which features two similarly long time-trials. Francaise des Jeux managed to put two riders off the front early in today's stage, and Belgium's Philippe Gilbert made the most of the break. Gilbert took the climber's jersey on the day's third climb, but he went over the day's last climb (at about 30 kms or 19 miles to the finish) with 5:58 in hand, and could see the leader's jersey within his grasp. At the finish, Gilbert led in the field by about 5:20, with Samuel Dumoulin of AG2R leading in the field at 5:19 ahead of a sprint won by Gerolsteiner's Peter Wrölich and Credit Agricole's Thor Hushovd at 5:23. Gilbert has more than a 5 minute lead on the entire field, and should lose only a little to the other GC candidates in tomorrow's time trial. Should be an interesting few days. "I haven't won in a long time and I wanted to savour it," Gilbert told Eurosport after the race. "This ride, I might pay for it - not tomorrow - but the day after and since I'm not a natural climber, I wanted to make the most of it." "It's the first time I wore the leader's jersey in such a big race," Gilbert added. "I will give it 100 percent the rest of the way."